Our Strindberg's Assistant is truly a no-budget project. We have begged, borrowed, and then spent the little cash we have to get this movie made. The cast and crew work for nothing but food and a desire to collaborate creatively on a film that we believe will live up to our expectations. Most of those involved have other jobs that pay their bills. As a result, getting everyone together is often a daunting challenge. So for some of the pick-ups, Mike the DP and Robert the Director have been cheating the shots. 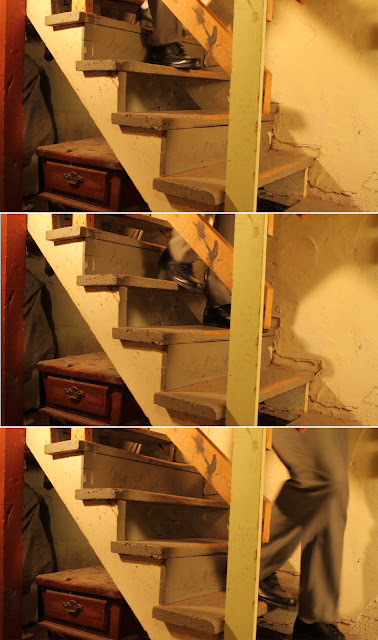 Last week, we needed to get Bjorne the Assistant (Patrick Garvey) coming down a set of stairs, then back up. But Patrick at the time was working in Chicago and unavailable. Instead, we simply went to Mike's house, put Robert in a pair of black shoes and gray pants, and ran him up and down the basement stairs. Shot from the waist down, we had our 1910 footage of the Assistant on the steps!